In parasitism, there is always exploitation and harm. However, such an association has been continuing, and there are no known cases of species extinction traced to parasitism. There are examples where the parasitism would appear to help the host in fulfilling a life purpose: Existence and species continuation. Furthermore, some parasitism appears to result in something that has higher value than the both host and parasite together. Cordyceps sinesis is a fungus that infects a type of underground caterpillar in the head in such a way that it ultimately projects itself out of the head, giving the appearance of half fungi and half caterpillar. The whole body is now known as yarsagumba (gold rush) and is very valuable in medicine as a vitalizing agent. As a parasite has to break through the different layers of defense mechanisms of the host in order to localize and thrive on the host, the parasite must be equipped with specialized mechanisms. The relationship, therefore, is generally strongly species specific; in other words, a particular parasite can infect only a particular host, not any other. The parasite causes harm to the host in many ways, such as by depriving the host of digested food; erecting mechanical blockades of food, blood, lymph, and bile passages; and causing tissue damages by rupture, enzymatic digestion, induction of autolysis, or secretion of toxins. Especially in the field of medical parasitology, the term "parasite" has come to mean a eukaryotic, pathogenic organism. Thus, protozoan and metazoan infectious agents are classified as parasites, while bacteria and viruses are not. Some of the parasitic protozoa are powerful agents of human diseases, such as members of the genera Plasmodium (cause of malaria), Trypanosoma (cause of African trypanosomiasis, or sleeping sickness, and Chagas disease, or South American trypanosomiasis), and Leishmania (cause of leishmania, which affects millions of people in Africa, Asia, and Latin America). Their life cycles include other animals. Plasmodium utilizes Anopheles mosquitoes in transmission, while some Trypanosoma species utilize the tsetse fly or conenose bugs, Leishmania is carried by sand flies, and Giardia is carried by muskrats and beavers (Towle 1989). Interestingly, fungi are not discussed in textbooks of medical parasitology, even though they are eukaryotic. For humans, parasitic diseases are largely preventable. Many foodborne or waterborne diseases can be prevented by careful handling, such as the filtering and boiling of water or cooking food thoroughly. For example, a person can become infected by the parasitic tapeworms Taenia solium and Taenia saginata by eating rare meat that has been infected, and the tapeworm Diphyllobothrium latum is contracted by eating raw, infected fish. Trichinella spiralis, a hookworm infection that causes the disease trichinosis, comes from infected pork, and the hookworm Ascaris comes via contaminated food and water. The hookworms Ancyostoma and Necator, which infect over 400 million people, enter through the feet of hosts, and thus wearing shoes in likely infected areas is a preventative measure. Washing one's hands before handling food can reduce transmissions of parasites from pets. Infection of malaria-causing Plasmodium from mosquito vectors can be reduced by using an insect repellent and sleeping in mosquito-netting protected by DEET. Types of relationships listed by the effect they have on each partner. "0" is no effect, "-" is detrimental, and "+" is beneficial. In general, symbiosis ("living together") is a close, interactive association of members of two or more species over a prolonged period of time. Parasitism is one type of symbiosis. In addition to parasitism, symbiosis encompasses commensalism ("eating at the same table," wherein two organisms co-exist in the same space, and one organism benefits while neither harming nor helping the other); mutualism (wherein both species benefit from the interaction); amensalism (whereby the association is disadvantageous to one member while the other is not affected); and neutralism (whereby there is neither benefit or detriment experienced by either members of the pair). There is one other theoretical category of biological interactions, but, if occurring, it would be rare and short-lived, and that is synnecrosis, which would occur when an interaction is detrimental to both species. The requirement for a prolonged interaction precludes predatory or episodic interactions (such as a mosquito feeding on a host), which are usually not seen as symbiotic relationships. It is important to note that these interactions are not always static. In many cases, two species will interact differently under different conditions. This is particularly true in, but not limited to, cases where species have multiple, drastically different life stages. Flea bites on a human. Ectoparasites are those that occur on the body surface of the host, like leeches, ticks, lice, and mites. Endoparasites are those that live inside the body of the host, such as hookworms that live in the gut of a host and blood parasites. Many endoparasites acquire hosts through entrance of the tissue, as well as through consumption of raw foods, such as the nematode Ascaris lumbricoides, an endoparasite of the human intestine. A. lumbricoides produces large numbers of eggs, which are passed from the host's digestive tract into the external environment, relying on other humans to inadvertently ingest them in places without good sanitation. Ectoparasites, on the other hand, often have elaborate mechanisms and strategies for finding hosts. Some aquatic leeches, for example, locate hosts by sensing movement and then confirm their identity through skin temperature and chemical cues before attaching. An epiparasite is a parasite that feeds on another parasite. 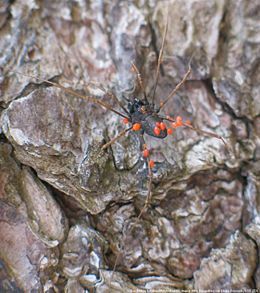 The parasite that is being parasitized by another organism is known as hyperpasasite or secondary parasite, and this relationship is sometimes referred to as "hyperparasitoidism," especially in the insect world. For example a wasp or fly larva may be an endoparasite of an Ichneumon wasp larva, which is in turn an endoparasite of a wood-boring beetle larva. Therefore, the ovipositing adult female hyperparasitoid must find the host of her host, namely the beetle larva, and oviposit into that beetle larva, after which her egg hatches within the beetle larva and seeks out the Ichneumon larva, ultimately burrowing into it and becoming an endoparasite. Hyperparasitoidism can be used for biological control of the pest and parasites. Macroparasites are multicellular parasites that are visible to the naked human eye, such as helminth parasites (parasitic worms, such as flukes, tapeworms, and roundworms, or nematodes). Microparasites are small, generally, unicellular and invisible to the naked eye, such as protozoan parasites. Mesoparasites are the ones that penetrate external openings, such as the buccal cavity, cloaca, external ear, and so forth. Necrotrophs are parasites that use another organism's tissue for their own nutritional benefit until the host dies from loss of needed tissues or nutrients. Necrotrophs are also known as parasitoids. Biotrophic parasites cannot survive in a dead host and therefore keep their hosts alive. Many viruses, for example, are biotrophic because they use the host's genetic and cellular processes to multiply. Temporary parasites (leeches, bed bugs) visit their host only for a short period of time. Permanent parasites spend the duration, or a part, of their life cycle in the host. Facultative parasites can survive without the parasitic mode of life, but can adapt to it if placed in such a situation; they are opportunistic. For example, the parasitic nematode, Strongyloides stercoralis, can also be free living. The majorities of parasites are obligatory parasites and are totally dependent on the host for food, shelter, and/or protection; they cannot survive without the host. Accidental parasites are those that happen to infect unusual hosts, other than the normal definite host. Wandering or aberrant parasites, instead of arriving at the site of infection in the definitive host, reach an unusual place as a dead end, becoming unable to complete the life cycle. For example, the tapeworm Taenia solium may migrate to the brain and remain there unless removed via an operation. Monogenic parasites complete the whole life cycle in one host, such as with Entamoeba histolytica. A digenetic parasite needs, in addition to a primary host, also a secondary host to complete the entire life cycle. Plasmodium vivax (malaria parasite) completes its asexual part of life cycle in people and the sexual part in the female Anopheles mosquito. Some parasites are social parasites, taking advantage of interactions between members of a social host species such as ants or termites, to the hosts' detriment. Kleptoparasitism involves the parasite stealing food that the host has caught or otherwise prepared. A specialized type of kleptoparasitism is brood parasitism, such as that engaged in by many species of cuckoo. Many cuckoos use other birds as lifetime "babysitters"; cuckoo young are raised and fed by adults of the host species, while adult cuckoos fend for themselves. Cheating or exploitation types of parasitism are often found in situations where there is generalized, non-specific mutualisms between broad classes of organisms, such as mycorrhizal relationships between plants and many types of fungi. Some myco-heterotrophic plants behave as "mycorrhizal cheaters," establishing mycorrhiza-like interactions with a fungal symbiont, but taking carbon from the fungus (which the fungus, in turn, gets from other plants) rather than donating carbon. A definitive host is usually the main host. For digenetic parasites, it is the host for the adult stage and for the completion of sexual part of life cycle. An intermediate or secondary host is a temporary environment, but one that is essential for the completion of a particular parasite's life cycle. Such as host is found only in the case of digenetic parasites for the completion of larval stage, asexual reproduction, and for transmission to the definitive host. An accidental host may be one that can function as the normal host, but is infected only occasionally for some reason, for example due to the lack of exposure or means of transmission. A vector is usually the intermediate host playing an active role in the transmission of the parasite. A permissive host is either a definitive, intermediate, or accidental host that allows the parasite to complete its life cycle in part or the whole. A non-permissive host, on the other hand, is a host organism other than true definitive host, which receives the parasite but the parasite finds itself in a dead end. A paratenic host or transport host refer to a host organism other than true intermediate host that receives the parasite in the position of intermediate host so that the parasite is helped to go to the definitive host. For example Echinococcus granulosus normally passes to a dog through an intermediate host, such as a goat or sheep. But the parasite, instead of passing through the intermediate host, may come to infect a human being and remain, causing hydatiditis, and a dog has no chance to get it from a person. Reservoir hosts are permissive host alternatives to definitive hosts, such that the infective stage can be passed from the host to the population of the definitive host. Biotrophic parasitism is an extremely successful mode of life. Depending on the definition used, as many as half of all animals have at least one parasitic phase in their life cycles, and it is also frequent in plants and fungi. Moreover, almost all free-living animals are host to one or more parasite taxa. Price (1977) maintains that parasitism is the prevalent means of obtaining food among organisms, that over 50 percent of the organisms living today are parasitic, and that there are more species of parasites than all non-parasite species combined. The hosts of parasites often have defensive mechanisms as well. Plants often produce toxins, for example, which deter both parasitic fungi and bacteria, as well as herbivores. Vertebrate immune systems can target most parasites through contact with bodily fluids. On a behavioral level, the itching sensation, and resulting scratching behavior, is also used to fend off parasites. Many parasites, particularly microorganisms, have adaptations to a particular host species; in such specific interactions, the two species generally have a relatively stable relationship that does not kill the host quickly or at all (since this would be detrimental for the parasite as well). It is important to note that "benefit" and "harm" in the definition of parasitism apply to lineages, not individuals. Thus, if an organism becomes physically stronger as a result of infection but loses reproductive capabilities (as results from some flatworm infections of snails), that organism is harmed in a reproductive sense and is thus parasitized. The harm caused to a host by a parasite can take many forms, from direct pathology, including various specialized types of tissue damage, such as castration, to more subtle effects, such as modification of host behavior. Price, P. W. 1977. General concepts on the evolutionary biology of parasites. Evolution 31(2): 405-420. All links retrieved January 14, 2019. KSU: Parasitology Research - parasitology articles and links. Division of Parasitic Diseases, Centers for Disease Control and Prevention. This page was last modified on 14 January 2019, at 21:55.